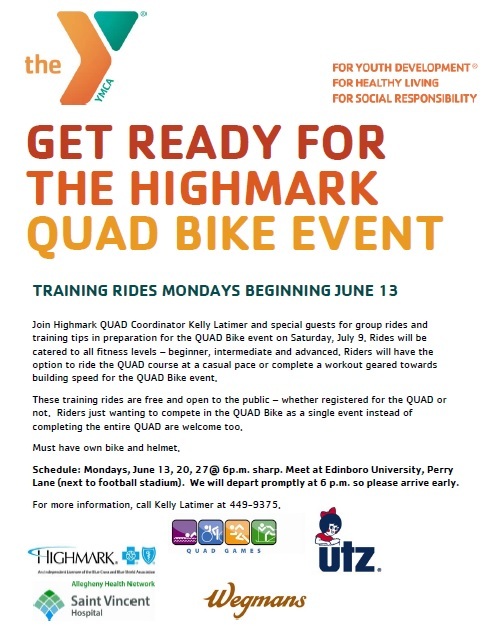 The Highmark QUAD Group Bike Rides start June 13th and continue for the next two Mondays (June 13, 20 and 27). Interested riders will meet behind Edinboro University’s football stadium along Perry Lane (QUAD Bike starting line) at 5:45pm and depart promptly at 6:00pm. All levels are welcome! We will be hosting three groups: A, B and C. Each group will have a leader to help riders navigate through the ride or workout. I will be bringing course maps for those not familiar with the route. Below you will find additional details on these group rides. Rides can be made competitive for those looking to gain speed and race at the QUAD Bike or these rides can be casual for those just looking to get on their bike and learn the course! 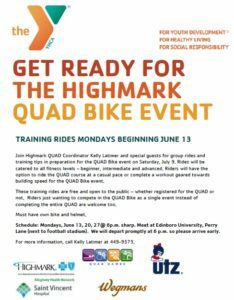 We want everyone to feel welcome and be prepared for the Highmark QUAD Bike on Saturday, July 9th. Whether you are planning to compete in this year’s QUAD Bike or not, come out and bring a friend! A good time is guaranteed to all! Don’t forget that a helmet is required by all participants.